bottom by using a fork to lift the crust from the pan. When using a grill ensure that your Little Zoe’s pizza pan is protected from direct exposure to Flame. Paper is Flammable and will burn! When grilling your pizza - Use a Stone, Aluminum foil, or Pan to prevent burning and scorching. 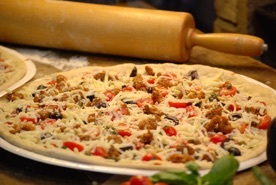 When using a Stone allow stone to pre-heat for 15-20 minutes prior to baking. For peak freshness bake immediately or refrigerate within 60 minutes of purchase. Bake Little Zoe’s pizza within 24 hours of purchase. For a crispier cheese and softer crust set oven to broil for the last few minutes of baking. When using a PIZZA STONE IN OVEN, preheat stone for 25-45 Min prior to barking. 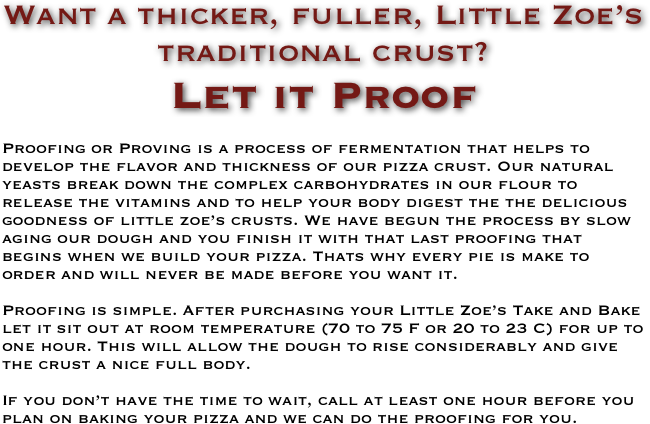 Little Zoe’s pizza can be par-baked and refrigerated for next day consumption. 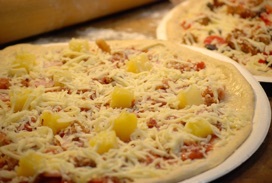 Reduce your normal baking time by 35% (3 to 5 minutes) and allow pizza to cool prior to refrigeration. Do not reuse paperboard pan to reheat pizza. To reheat, remove pizza from paper pan and place pizza on a baking sheet, aluminum foil, or on the oven rack and bake at 400 F for 3-7 minutes.